DEARBORN HEIGHTS, MI - JUNE 13: Iraqi and Lebanese Shiite Muslims place copies of the Quran on their heads while praying during "Laylat al-Qadr," known as he Night of Power after Ramadan's Iftar dinner on Tuesday, June 13, 2017, at The Islamic Institute of America in Dearborn Heights, MI. The Night of Power is Muslims holiest night because its believed to be the date when the Koran was revealed to Prophet Muhammad. An Iraqi-American photojournalist, Salwan Georges was born in Baghdad, Iraq during the First Gulf War. He fled with his family to Syria when he was 8, and finally arrived in the U.S. in 2004. 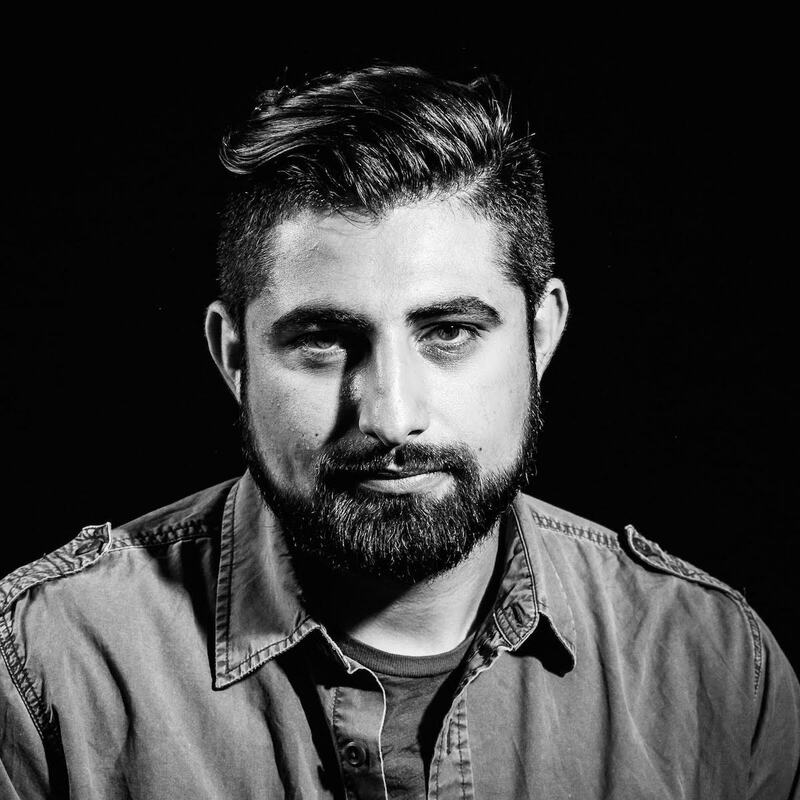 After receiving his degree in journalism at Oakland University in Michigan, he quickly made his mark at the Detroit Free Press, with his remarkable still and video work focusing on the changing face of the metro area, and growth of one of the largest Arab communities in the United States. Since 2017, Georges has worked as a staff photographer for the Washington Post. You can see more of his work on his website. He will be at the Focus on the Story International Photo Festival presenting and discussing a project for the Washington Post where he captured the everyday lives of an Arab-American Muslim immigrant family in Michigan. As Georges put it, he wanted the project to demystify people who at times had been characterized as a threat to America. Georges will present his work at the Focus on the Story International Photo Festival. 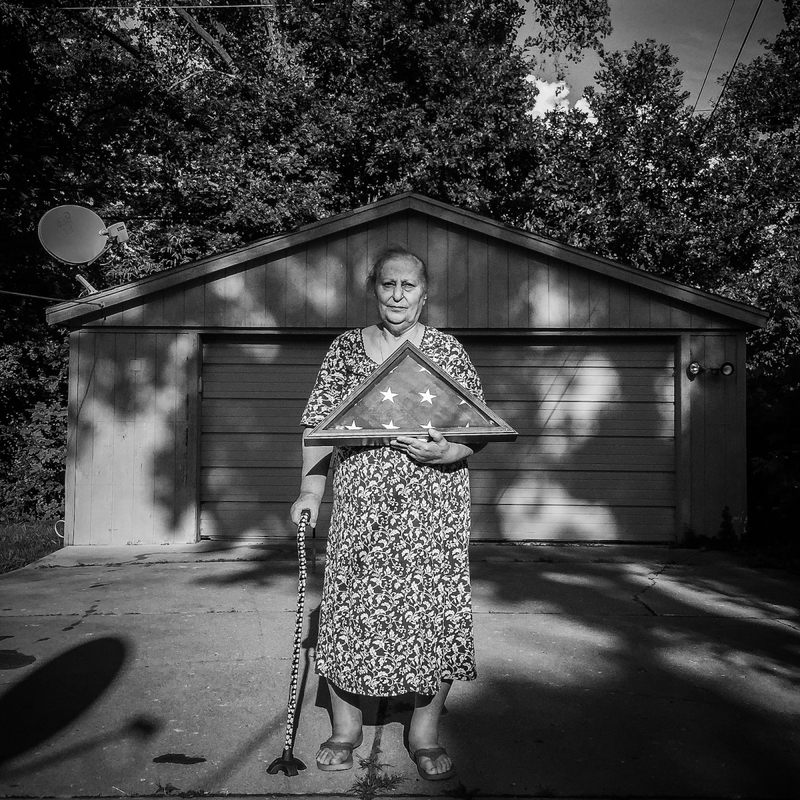 "My grandmother pose for a portrait holding my uncle's Saher memorial flag at home in Southfield, MI on the 10 year anniversary of his death. August 28, 2016." Salwan Georges: My inspiration to become a photojournalist comes from the people around me, including my family, who have struggled as refugees and immigrants in a new country. Having been a refugee and then as an immigrant in the U.S., I wanted to raise awareness and share stories of many like mine. The moment I decided to do this work was one day in December 2011 when my family received the news that my cousin had been killed by a terrorist group in Baghdad because of his faith. That’s when I realized, I need to share my story. Lee: In some of your well-known work, you make use of multiple perspectives, including dramatic low and high angles. What influences you in making those decisions, and how do they impact your storytelling in your reportage? Georges: Each assignment I get requires it has its own situation. It all depends how much time I have with each one. Sometimes I follow a subject for several days. This allows me to see them in m different moments and multiple perspectives. With other assignments, I normally spend an hour or two shooting, then editing and sending the images on to the newsroom for tomorrow’s paper. I try to make use of the environment around me so that I can tell the story in the best possible manner. 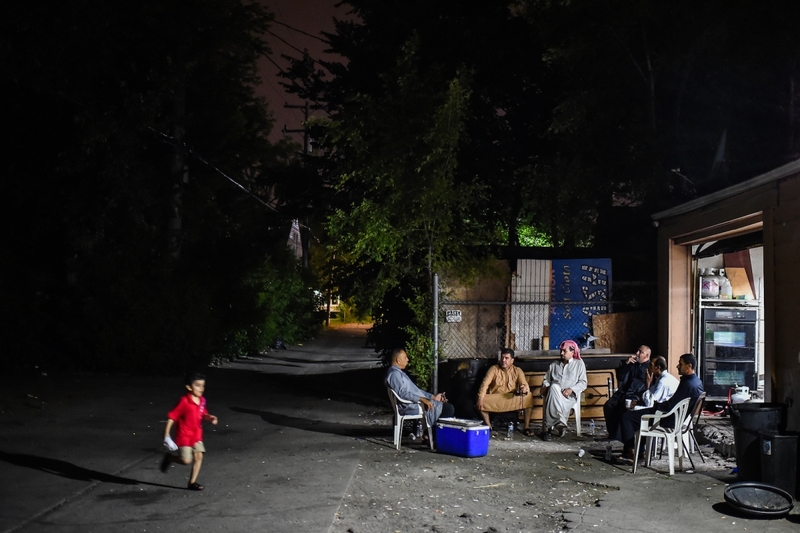 Iraqi men sit at the back alley of the Rafha Islamic Center after a Ramadan iftar dinner on Thursday, June 15, 2017, on the border of Detroit and Dearborn, MI. Young men arm wrestle past midnight as they wait for their sandwich at Jay's BBQ stand during Ramadan in Dearborn, Michigan. Lee: One of your projects is about Hamtramck, Michigan, which for years has been transitioning from a Polish-American enclave to an Arab-American majority community. What can you share with us on what you see in how the two communities interact as the city changes while you convey their stories? Georges: The story of Hamtramck is happening all across the U.S. as waves of immigrants are making their way here to escape wars and search for better opportunities. Different cultures are blooming in various enclaves. But to me, this is a reminder that this country was built by immigrants. Barbudan men rest on a ferry returning to the island of Antigua after working on their destroyed homes by the hurricane on the island of Barbuda on Thursday, November 30, 2017, in St. John's, Antigua and Barbuda. Lee: Your first foreign assignment with the Washington Post was about the people of Barbuda, an island destroyed by Hurricane Irma. Tell us about the experience and its personal impact as a photojournalist in their first assignment outside of the U.S.? Georges: It was my first time to visit any Caribbean island and it happened to be Antigua and Barbuda on assignment. After leaving the airport in Antigua, I expected to see signs of destruction, but the island had been spared the worst. Everything looked like what you’d imagine a tropical island looks like. People were selling fruit and coconut water on the side of the road. It felt like paradise on earth. My first day on the island, I met with some of these evacuees — entire families who were just waiting to go back and assess what remained of their homes. For some, starting a new life in Antigua was their only hope. 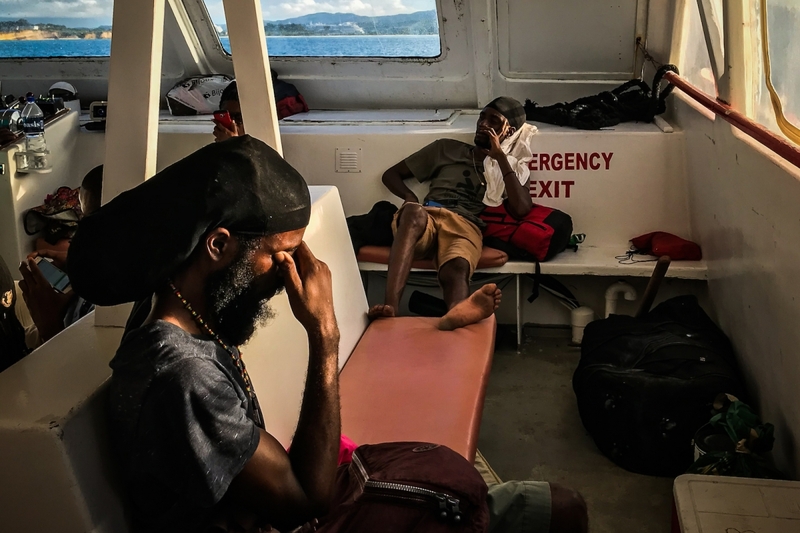 The next day, I took a high-speed boat with Anthony Faiola, The Post’s South America/Caribbean bureau chief, to Barbuda with a local medical and sanitation group to see the destruction for ourselves. As we got closer to Barbuda, a jewel in the Caribbean, everything felt calm. We were silent as we disembarked, taking in what was in front of us. I did not know where to start or what to photograph first. Everything was destroyed. The homes around me had no doors and windows. Walking down the streets of Codrington, the only town on the island, it felt as though a nuclear bomb had been dropped just a few days ago. I followed a Barbudan couple working with the Red Cross as they looked for their house. I can only imagine what they felt as they walked their streets, seeing their neighbors’ houses gone. It probably felt the same as when I saw the televised destruction of my home country years ago. 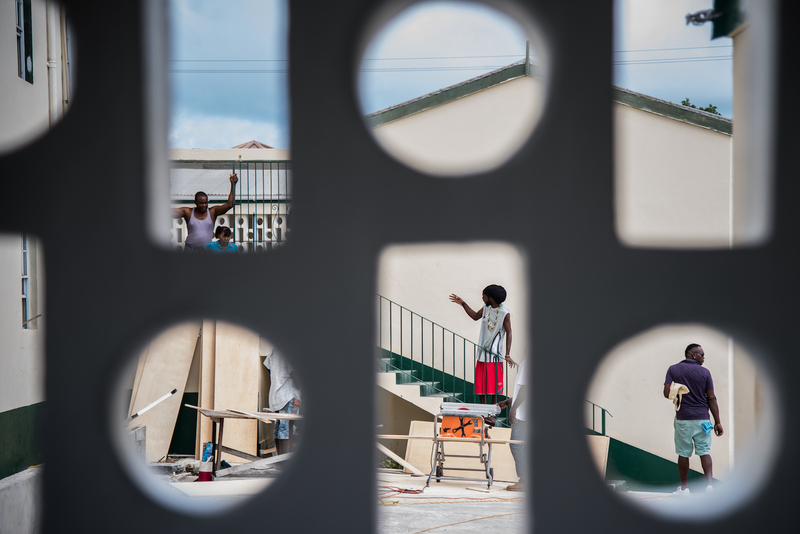 Contractors work at the building that is being renovated to shelter the Barbudians evacuees on Saturday, September 23, 2017, in St. John's, Antigua and Barbuda. Lee: You participated in the Eddie Adams workshop, one of the most prestigious and intensive programs for photographers, particularly photojournalists. What was that experience like? What can you share with us about what you learned from the workshop and its impact on your work? Georges: I will never forget my time at the workshop. This was a great experience for me to meet so many mentors, but also inspiring photojournalists that are from all over the world working on important issues. Our team leaders worked closely with us to meet our deadlines and talked to us about what things we may experience in the field and how to prepare for it. Many participating in the workshop, are working professional photojournalist, for me, thankfully, I had already was on my first year as a staff photographer at the Detroit Free Press. Some of the speakers at the workshop were among those who I looked up to while in school. To be there with them in the same room is really special.